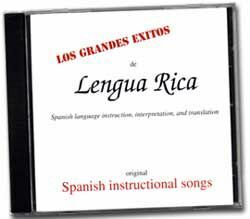 At Lengua Rica, we perform the songs from our CD live. They form an integral part of our curriculum. We encourage students to learn them, but we also hope they are inspired to write their own, and sometimes we have them do just that! On the CD, each song is labeled with its own grammatical or functional learning objective and is geared toward students at a particular proficiency level. This is indicated beneath the title of each song. AND THE SONGS ARE NOT INFANTILE! The songs' music, content, and humor are specifically geared toward adults and mature teens. "I used the 'Justicia' song... with my Advanced students during my principal's observation, and they all LOVED it!!! Thanks again!" "Thanks so much for this CD. I have used a couple songs in class. My students' favorite by far is 'En la Mañana.' I also used 'Tengo un carrito' to help teach direct objects. It is a very useful CD in that it is organized grammatically. I plan to use 'Hola Clase' next year, and 'Arriba, Abajo' also looks good." This page was last modified: 07 August 2018.